John and I adopted Chewy in September of 2010. Chewy is the love of our life and has the most precious personality. He is incredibly patient with children, he is quiet so he can be taken anywhere and is the sweetest and affectionate little boy. I attribute all of this to Veronica's breeding. He is such a well balanced little guy and I can assure you John and I have nothing to do with it. John and I treat Chewy like a son so needless to say we were very nervous first parents. Veronica has been such a wonderful resource and friend. I have called her many times over the last year and a half and she has always been very sweet, calming and incredibly knowledgeable. She never made me feel like I was overreacting when I would call about the smallest thing. 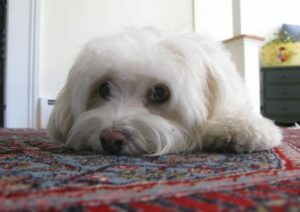 John, Chewy and I just moved to California from NYC and we have already talked about the fact that when we decide to add another Havanese to our family we will be flying back to the east coast to get him or her from Renaissance Havanese.